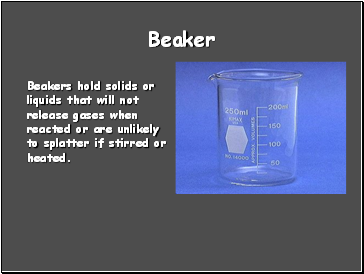 Beakers hold solids or liquids that will not release gases when reacted or are unlikely to splatter if stirred or heated. 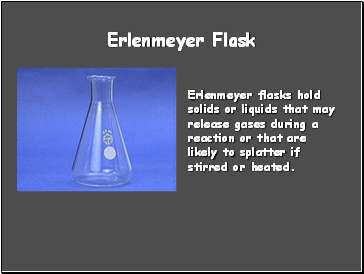 Erlenmeyer flasks hold solids or liquids that may release gases during a reaction or that are likely to splatter if stirred or heated. 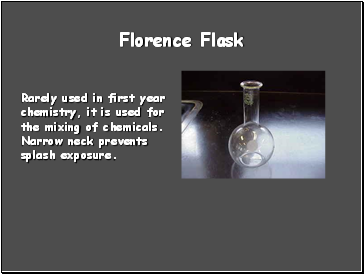 Rarely used in first year chemistry, it is used for the mixing of chemicals. Narrow neck prevents splash exposure. 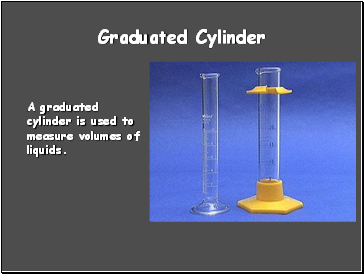 A graduated cylinder is used to measure volumes of liquids. 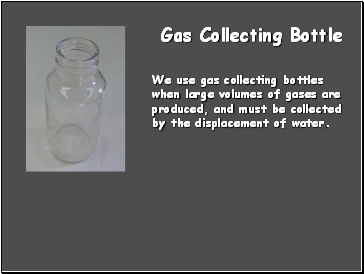 We use gas collecting bottles when large volumes of gases are produced, and must be collected by the displacement of water. 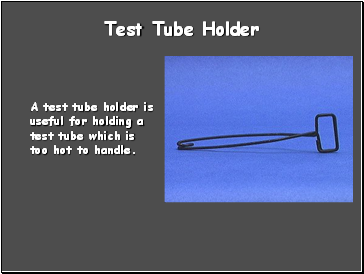 A test tube holder is useful for holding a test tube which is too hot to handle. 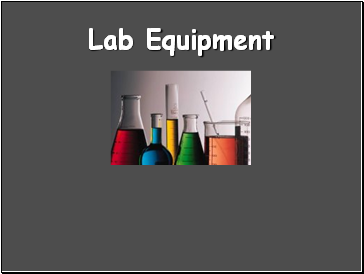 Test tube brushes are used to clean test tubes and graduated cylinders. 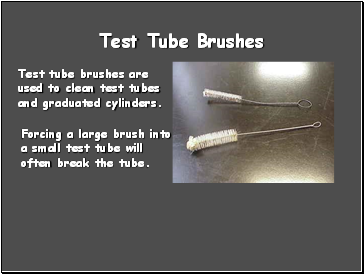 Forcing a large brush into a small test tube will often break the tube. 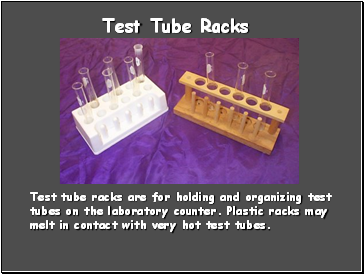 Test tube racks are for holding and organizing test tubes on the laboratory counter. 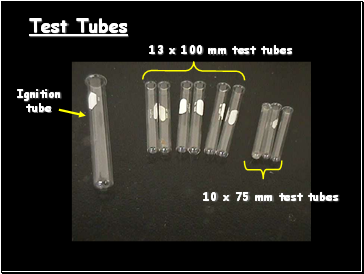 Plastic racks may melt in contact with very hot test tubes. 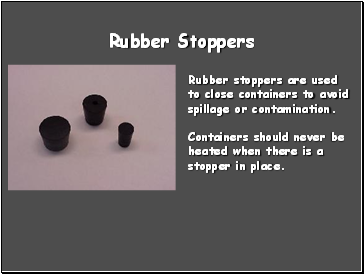 Rubber stoppers are used to close containers to avoid spillage or contamination. Containers should never be heated when there is a stopper in place. 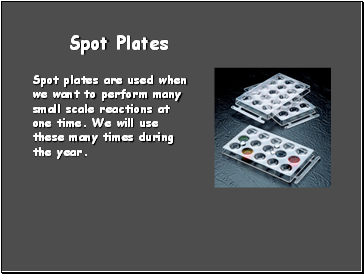 Spot plates are used when we want to perform many small scale reactions at one time. We will use these many times during the year. 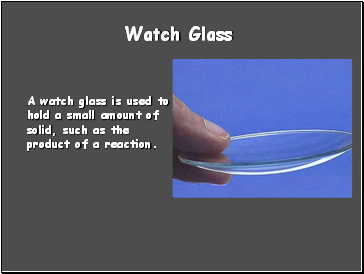 A watch glass is used to hold a small amount of solid, such as the product of a reaction.